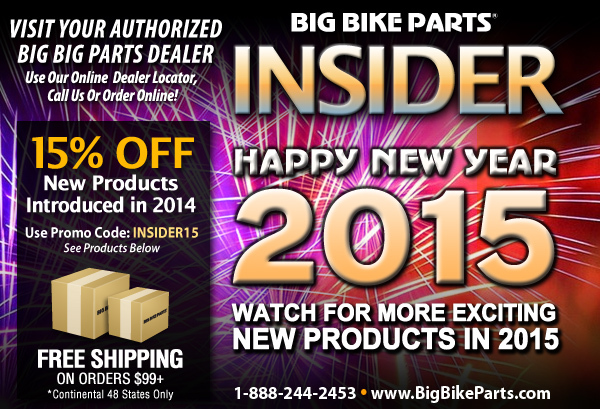 USE PROMO CODE: INSIDER15 – Limited to current inventory. Hurry, offers are good only until Feb. 28, 2015. 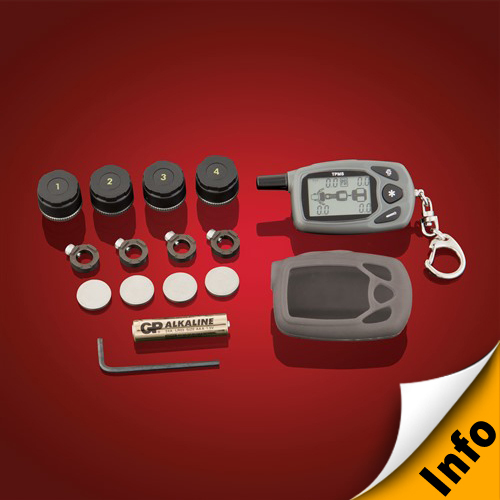 **To receive sale prices above, use coupon code: INSIDER15 at check-out. Limited to current inventory. Hurry, offers are good only until February 28, 2015. 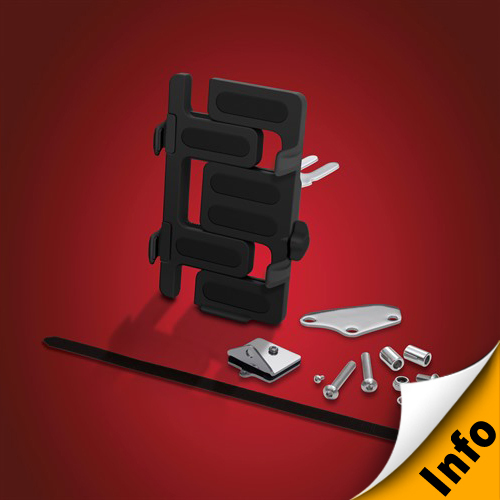 Rice Lake, WI – Big Bike Parts® updates their popular Passenger Vantage Board kit by adding an easy to install button socket head cap screw. 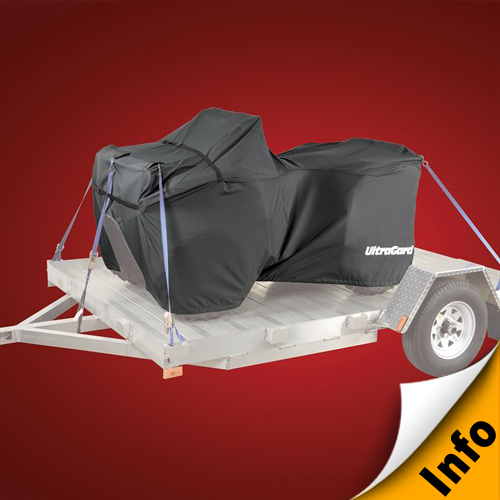 The newer Can-Am models come with a standard hex head bolt on the passenger foot peg mount, which makes for difficult removal and installation of different floorboards. 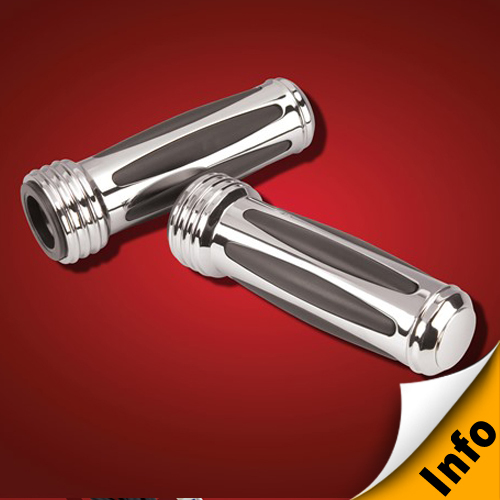 It’s tough to get a socket wrench to fit and near impossible to use a wrench so Big Bike Parts® makes life easy by adding a much more manageable M8 – 1.25 x 80mm button socket head cap screw. 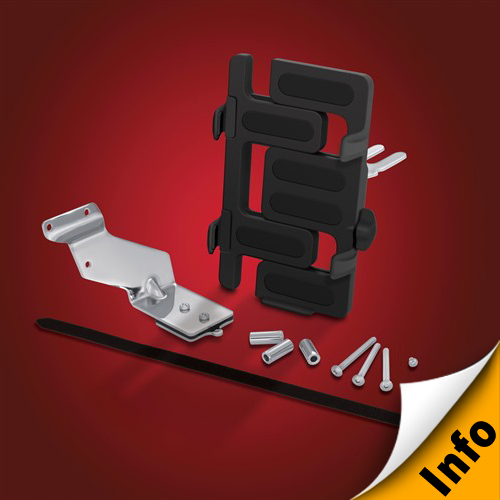 Find your trusty hex key set and installation is a breeze. 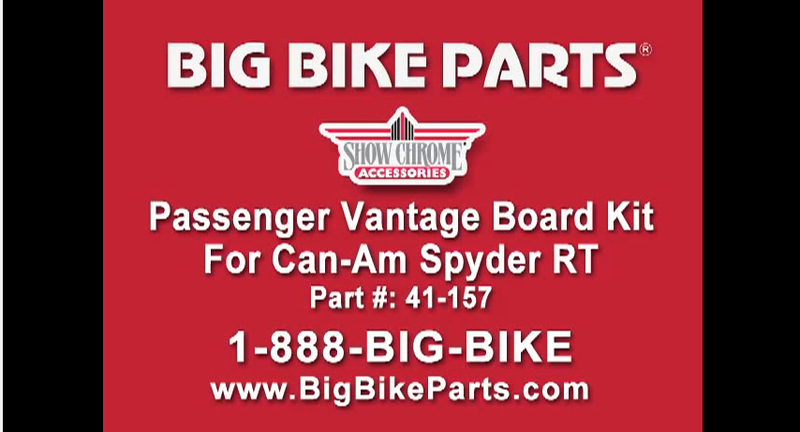 The Passenger Vantage Boards are CNC Aluminum with a brilliant chrome finish, with raised rubber comfort pads and include a solid cast mount with Big Bike Parts® anti-rotation system designed right in. For Can Am Spyder RT. 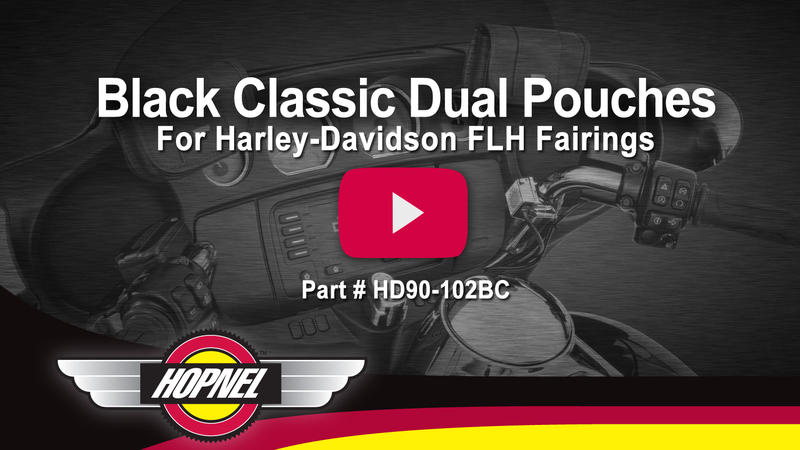 Rice Lake, WI – Hopnel™ sewn products introduces their popular Black Classic look to these must have dual fairing pouches. Get your on-bike storage convenience enhanced with these well placed pouches that add a dash of flair and a touch of chrome to your fairing. 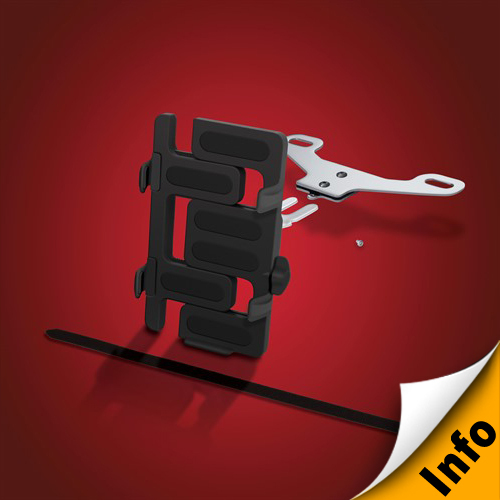 These Black Classic pouches mount to the windshield mounting bolts and are further secured by the compression between the windshield and fairing. Measuring 4 ½” x 3” x 1 ½”, these pouches are a perfect place for garage buttons, phones and other smaller items you want readily available. 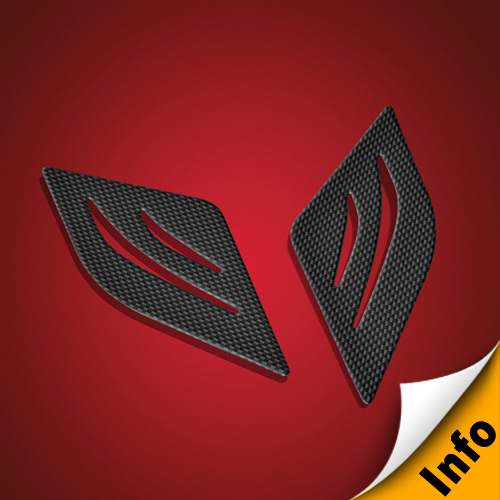 The dual pouch design also allows air to pass through the new vented Harley fairing unobstructed. 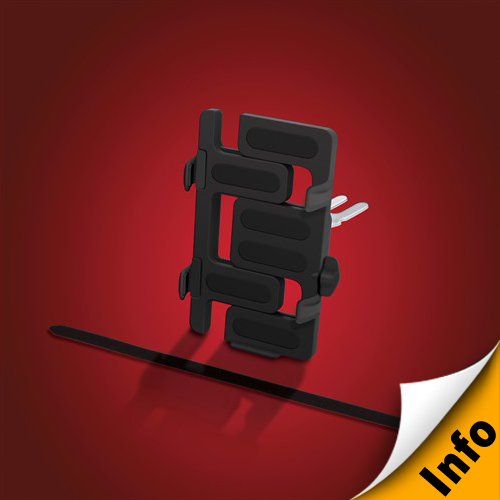 Pouches also come with two large pieces of hook and loop attachments to allow further securing of the pouches, pieces can be placed at your preference to provide optimal positioning of your pouches. Sold as a pair for the 1996 to current FLH Harley’s. Rice Lake, WI – Riding year round takes courage in the colder months, let Big Bike Parts® heated grips keep your hands warm so you can focus on riding safely and comfortably. 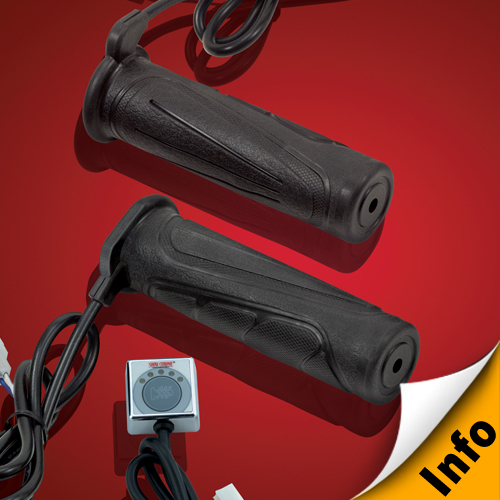 Our market leading Comfort and Inferno Heated Grips accomplish this best by heating your hands directly. 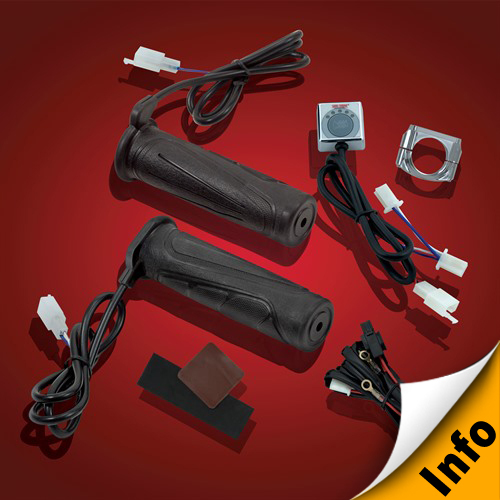 It is surprising that some manufacturers come up with systems to heat the inside of the handlebar or attempt to clamp and cover an existing heated grip under the guise of improved function. 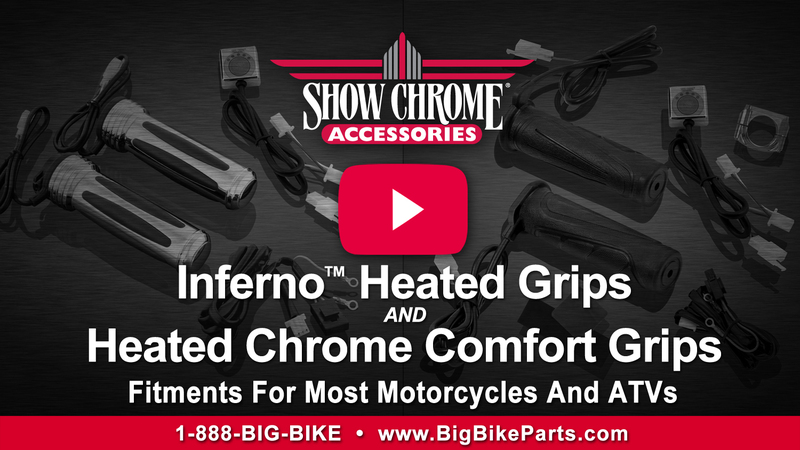 If the goal is to get the heat to your hands as fast as possible and keep it there, then choose Big Bike Parts® heated grips that have a custom manufactured heat coil that is embedded directly into the rubber of the grip just below the outer surface. 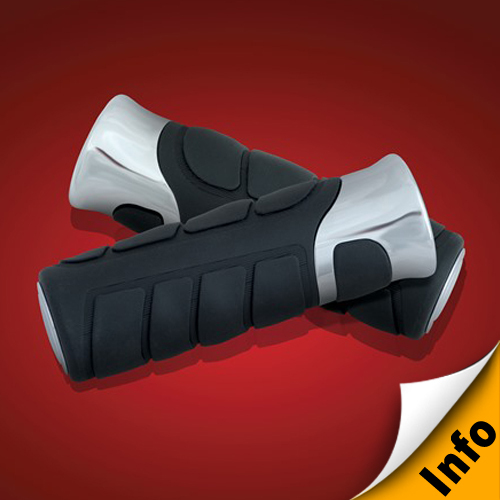 This allows warmth to be felt in seconds as the grip starts to heat. When you have a cold soaked pair of handlebars at 10°- 30° F and you’re riding in 10°- 30° F temperatures, why waste time heating handlebars when you really need the heat in your hands. Big Bike Parts® tests its heated grips to achieve an inside grip temperature of 175° to 200° F. This allows ample heat to get to your hands. In Northern Wisconsin, Big Bike Parts® knows what it takes to stay warm and has road tested new models in January’s frigid temperatures. They have experienced that in 20° – 30° F degree weather at 60 MPH they have needed to turn the temperature due to very adequate heat being available. 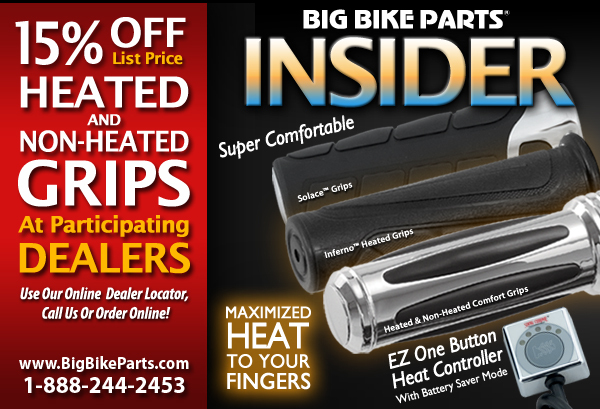 Each of Big Bike Parts® heated grips comes with selectable heat settings to allow you to choose a heat that fits your ride. 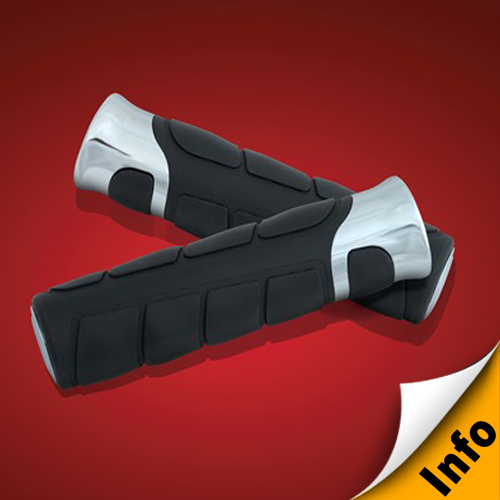 Available in their Chrome Comfort Grips or their newest Inferno Grips with prices starting from $79.99. 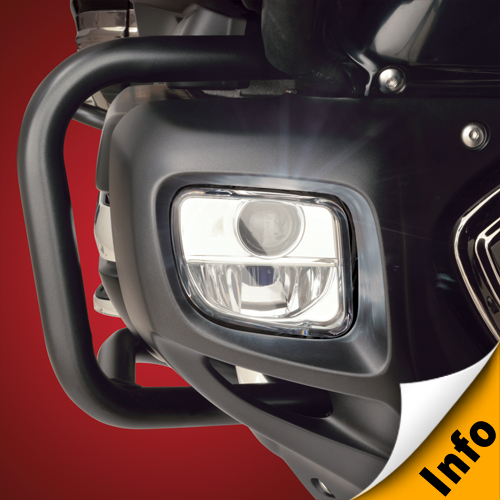 Rice Lake, WI – Big Bike Parts® increases rider visibility for the Yamaha Royal Star Venture with two new light bar fitments. 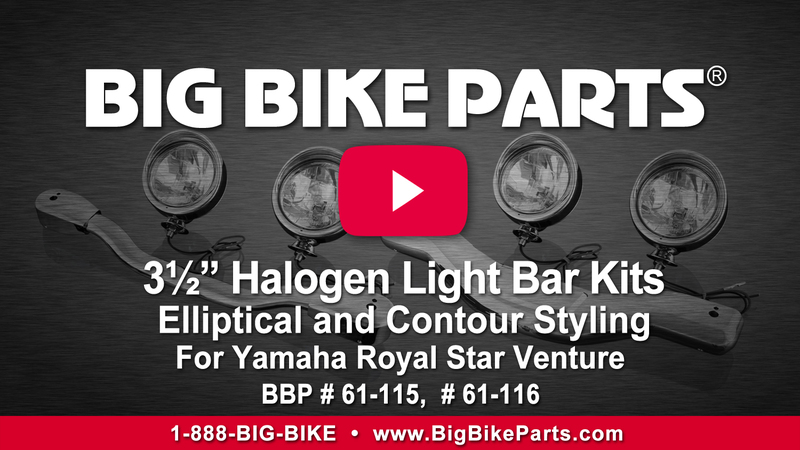 These bright 3 ½” 55 Watt Halogen light bars are available in Big Bike Parts® Elliptical or Contour styling. 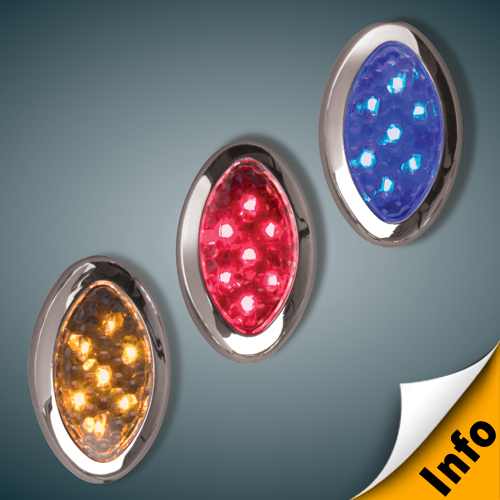 The Elliptical light bar is a more traditional look made from formed chromed steel. 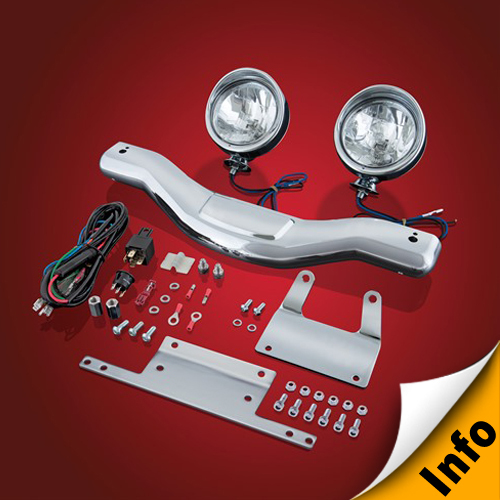 The Contour light bar is light weight and made from strong CNC forged aluminum. 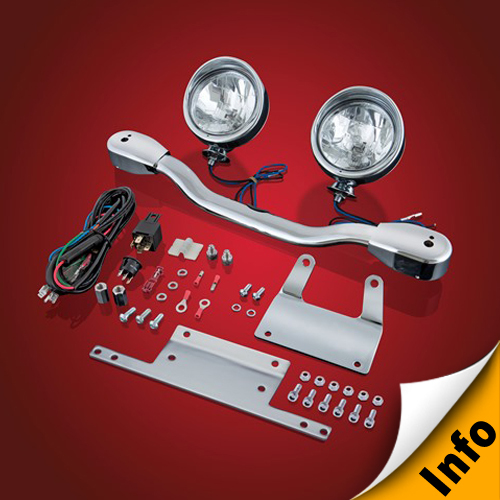 Both light bars have turn signal relocation access below the driving lights to mount either OEM or custom turn signal relocation mount kits sold separately. 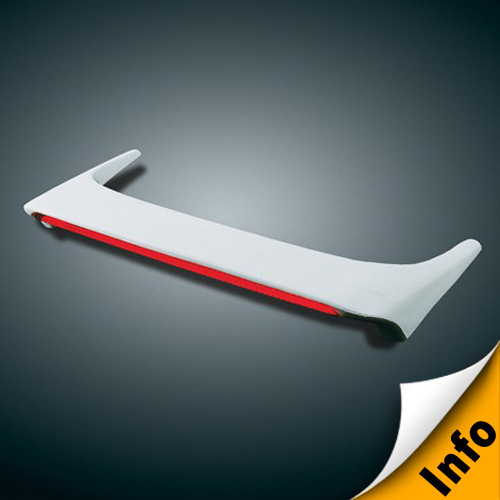 Includes mounting bracket to remount the OEM fork deflectors. Limited to current inventory. Hurry, offers are good only until January 31, 2015.